Celebrate your baby girl's big day with charming invites finished with her sweetest pics. Your baby's 1st birthday is a special milestone that deserves a celebration. Get family members and friends excited about commemorating this occasion with you when you send stunning 1st birthday invitations. Shutterfly features a range of lovely invitation designs for both boys and girls. And we make it easier than ever to create beautiful, personalized stationery that’s perfect for announcing the birthday celebration for your little one's first year. 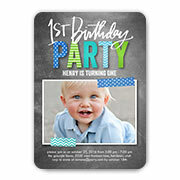 Send your 1st birthday party invitations out at least three weeks before the party to give everyone enough time to make arrangements to attend. 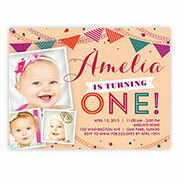 Turn your special memories of your baby’s first year into beautiful, custom 1st birthday invitations. Whether you want to feature one favorite photo as the central focus of your invitation or create a collage from many pictures, it’s easy to upload your pictures to Shutterfly once you’ve selected a design. Personalize your invitations even further by adding your own design elements with our wide array of customization options, including fonts, text sizes, colors, and trim styles. Also be sure to include important information guests will need to know in advance, such as the day, time and location of the birthday party. Make sure to request an RSVP to help you plan ahead as much as possible. Speaking of planning, does your little one’s 1st birthday party have a fun theme? Whether your theme is princesses, superheroes, trains, woodland animals, cupcakes, “under the sea” or simply a pair of favorite colors, be sure to incorporate décor and desserts that will make your theme come alive and make your guests feel festive. Looking for some ideas? Our custom photo plates are a smart choice, as they provide a practical use and are an adorable way to display some additional favorite photos from your baby’s first year. Creating a themed photo booth is a great way to engage guests of all ages and enables you to grab fun, playful photos of everyone at the party. Following the celebration, send personalized birthday thank you cards. You can turn your favorite memories from the birthday party into thoughtful thank you cards to keep the memories flowing. This is also a touching way to let loved ones know how much you appreciated their love, gifts and simply seeing them at the party.